AmazonCalvin Klein’s products advertised on Amazon. Amazon now offers a bigger selection of Calvin Klein and Tommy Hilfiger clothing than Macy’s and JCPenney do, according to a recent report from Nomura. These brands, which have historically had a big presence in department stores, are increasingly moving away from this channel to protect their brand image and boost sales. Analysts say Amazon is on track to overtake Walmart and become the leading US apparel retailer in 2018. It is now looking to move beyond basics and into fashion more broadly. One of the biggest fashion retailers in the US is going all-in on Amazon, and it’s telling of where fashion is headed. 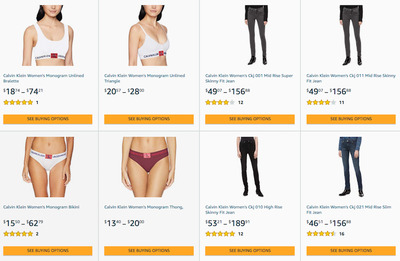 According to a recent report from Nomura, Amazon now offers a bigger selection of Calvin Klein and Tommy Hilfiger clothing than Macy’s and JCPenney do. These brands, both owned by PVH Corp, have historically had a strong presence in department stores. However, Nomura data shows that they are shifting away from this channel in search of greener pastures. While department stores have struggled in recent years, Amazon has been growing its apparel business exponentially. Analysts say it’s on track to overtake Walmart as the leading US apparel retailer by the end of 2018. “Department store heavy dependent brands could potentially see a growing Amazon apparel push as a plug to longer-term department stores woes,” the Nomura analysts wrote, adding that recent upticks at these stores are cyclical, not structural. “Although Amazon’s apparel push poses a threat to the traditional apparel store model, assuming it does thrive, we wonder if it may actually help brands,” they added. While Amazon is currently better known for its clothing basics, it has been making a push into fashion more broadly by bringing on popular brands including Nike and J.Crew most recently. It has also accelerated the growth of its private-label brands and expanded Prime Wardrobe, a try-before-you-buy service. Other brands have been vocal about pulling back from department stores in order to protect their brand image after finding that products have been heavily discounted in those stores. Michael Kors is one of those brands. The company is trying to reposition itself as a high-end retailer, and to do so, it is reducing promotions and scaling back from department stores to make the brand less available to the mass market. Coach and Ralph Lauren are doing the same. In 2016, Coach said it would be shuttering 25% of its 1,000-plus wholesale locations along with a “reduction in markdown allowances” to preserve the brand’s status after being deemed too ubiquitous and promotional. Similarly, Ralph Lauren CEO Patrice Louvet pulled stock from 20-25% of department stores in August 2017, saying that discounting was damaging to the brand.